Mediation is a voluntary, confidential process in which a mediator helps your clients to discuss the outstanding issues between them. With the help of this neutral third party, they determine whether they can agree on some or all of the points of contention. Mediation offers an alternative to the adversarial system of resolving differences. Litigators are trained to take a position and dig in for the long haul. This type of legal “trench warfare” is not conducive to reaching a quick settlement of the dispute between the two sides. Mediation may break the deadlock and gets the parties to refocus, rather than trying to win points at the expense of the other party in the dispute. This process facilitates finding a common ground and the parties are able to move forward to reach an agreement. The mediation process is less expensive than having lawyers prepare for a trial. Trial preparation involves countless hours, if not days, of billable time. During this process, it is imperative that the lawyer becomes intrinsically familiar with the facts and the law pertaining to the case. The lawyer must decide whether expert witnesses, as well as other witnesses, will be called at trial. Arrangements are made for witnesses to appear, which includes serving formal notices and specific appearance fees and travel expenses. Going to trial always leads to uncertain results. Both sides give up control over the outcome, no matter how well prepared the lawyers are before the proceedings. Taking the dispute before a judge means turning the disposition over to a stranger or strangers. The judge and or jury does not know either party personally, but is responsible for making a binding decision that will effect both of them. There is a better way to deal with disputes. S.J. 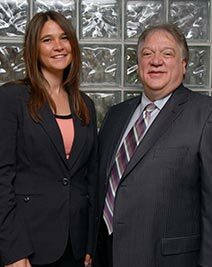 “Chip” Petrillo is an experienced lawyer with over 20 years of resolving conflicts through mediation. He is a graduate of the Harvard Mediation Program (HMP). Through his experience as a senior trial lawyer, Chip has represented clients on both the plaintiff and defense side of a legal action. This unique outlook allows Chip to sit down with both sides as an impartial third party with two lawyers and their clients. He doesn’t tell either one what to do or how to settle the issues between them. Instead, his role as a mediator is to help the two sides communicate with each other so that they can attempt to move toward a settlement on their own. Chip cares about the people he works with and strives to help all parties involved in mediation agree on some or all of the issues in dispute. He knows that going to trial should be the last resort when dealing with differences and is interested in helping the participants find some common ground in order to resolve some or all of their issues. The boardroom at Petrillo Law in Mississauga is available for mediation meetings. We also make it available for rent for mediation services. 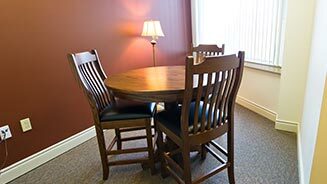 Our boardroom can accommodate up to 12 people, and we also have two break out rooms if required. Chip Petrillo is also available for offsite mediation meetings in Mississauga and the GTA. To schedule an appointment, please call Karen, our mediation director, at (905) 949-9433 for a free consultation.